Auto Motor Sport — "A Successor for the Speedster"
"A Successor for the Speedster: Porsche Convertible D"
The Speedster, the cheapest Porsche model, has had some improvements, and is now called the Convertible D. The English name makes it clear, just as it was the case with the Speedster, that the car is mainly meant for the overseas market. The Convertible D competes in price and equipment with the British MG, Triumph and Austin Healy. 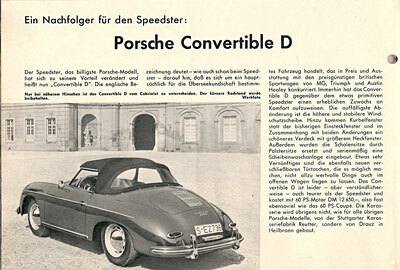 Compared to the rather primitive Speedster, the Convertible D has much more comfort. The most notable change is the higher and more stable windshield, instead of the removable plastic doorwindows, the Convertible D has crank windows and a more beautiful roof with larger rear window. The bowl seats are replaced with padded seats and a window washer is standard equipment. The new doorpockets can be called a real nice improvement, as they can be closed which makes it possible to leave valuables in the car, even with the roof opened. Unfortunately, but completely understandable, the Convertible D is more expensive then the Speedster. Equipped with the 60 HP engine, it costs 12,650 German Marks, almost as much as the 60 HP Coupe. The coachwork is not done by the Stuttgart Coachwork builder Reutter, but by Drauz in Heilbronn.